A ‘first impressions’ review of my new Adjustoform dress form. As a dressmaker, a crucial part of my sewing equipment is my dress form. Up until now I have been using a very old and battered dress form which came to me in fairly bad condition, second hand, several years ago. She has served me well over the years but recently decided that enough was enough and refused to stand up any more despite several repairs to the legs. As somebody that spends time sewing in one form or another most days, I missed her tremendously. I hadn’t quite realised how much I relied on her until she was finally unusable. You can imagine my relief when Adjustoform came to the rescue and very generously provided me with a beautiful new model to use and review. The following is my entirely honest thoughts on her construction, set up and features. Inside the box were all the parts required to quickly and easily assemble it along with a simple instruction sheet and a booklet describing how to get the best out of your dressmaking model. To assemble the stand it was just a case of simply slotting in the four feet to the bottom of the stand. Nice and simple. The stand feels strong and sturdy. Then you can just pop the body onto the post and secure by tightening the adjustable screws. (By hand – no tools required). Isn’t she beautiful! Front and back. 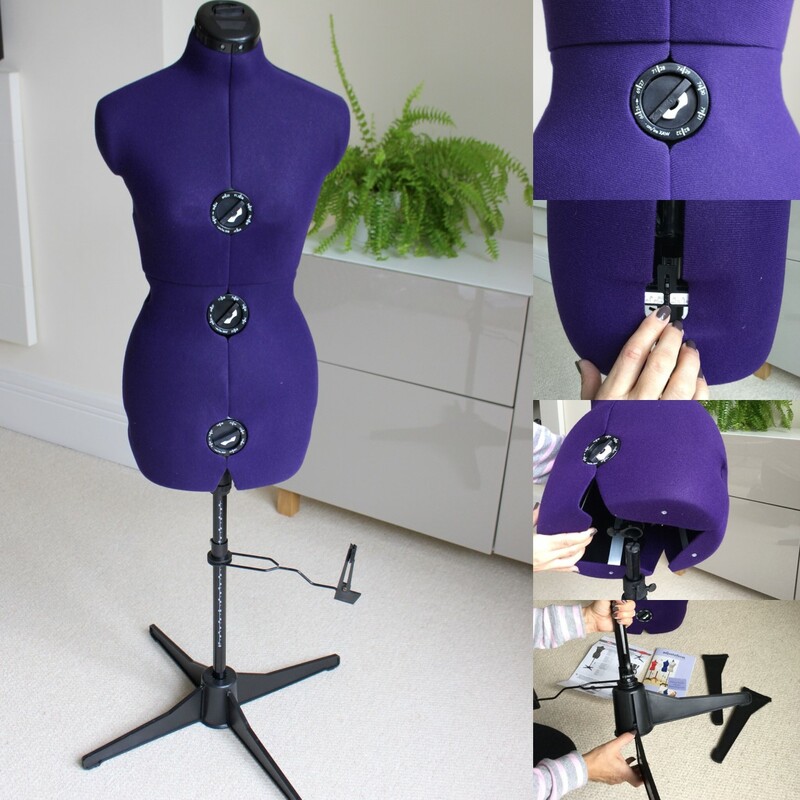 She is an adjustable 8 part dummy, so after this basic set up you can adjust her to replicate your measurements. To do this you alter the 3 dials and 9 adjusting thumb wheels to give you an exact fit. In addition to this she has an easily adjustable back/waist length as well as the opportunity to adjust the neck. All incredibly simple to do. Finally adjust the height to match your height and hey presto! you are good to go! She is covered with a nylon, foam backed fabric to allow for easy pinning and has a handy little pin cushion at the top! By far my favourite feature of this beauty though is the hem marker with basting attachment. This feature had always been broken on my last old model and boy! is this a useful gadget to have. Simply decide what hem length you need and open and attach the fixation clip on the hem at that point, slide the pin through the pin guide and when you remove the fixation clip your pin is magically in place on the garment exactly where you want it! Repeat at regular intervals and there you have a perfectly level hem marked out! Genius! I now have level hems on my handmade garments for the first time ever!! My new sewing assistant is already a firm favourite of mine. Although I have not had her for very long, I have used her to help me make 5 tops and 3 dresses so far. One of the dresses I recently made has a lined bodice and the dress form was so useful in pinning the lining in place (whilst the garment was inside out), without it pulling at any point. I also think with any dress it is good to let it hang on a dress form for 24 hours before hemming it. This is especially important of course with skirts/dresses cut on the bias or when using knit fabrics, simply hanging on a hanger will not give you the same result. Almost finished – just hem and sleeves to go! The dress form enables me to check on my dart placements now without having to repeatedly try the garment on. Pockets and buttonholes can be checked on the dress form now in the same way without me having to try it on several times. I am also looking forward to making up new patterns that I have not sewn before as it will be easy to fit and adjust a paper pattern on the dress form to try to work out some of the potential fitting issues before I cut into the fabric. Although I have only used it for a few weeks and therefore can only review this on the short time I have owned it, I am thrilled to bits with it. It is, in my opinion, one of the most useful items in my dressmaking kit, and I do not want to be without one again! This model does everything I need it to – and more, and is simple to set up and use straight away. You will be seeing a great deal of her in my future makes, and I will continue to share with you any info on the model as and when I think you could find it useful. 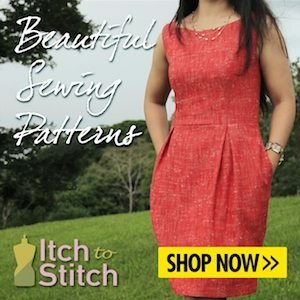 This particular dress form is just right for me, it would be perfect for a beginner seamstress right through to the more experienced sewist, and it could just be the perfect Christmas gift don’t you think? Adjustoform have a small range that you can purchase on their website – alternatively you can also search their website for local suppliers here. Correct me if I’m wrong but I’m sure I’ve seen several types of Adjustoform models in the John Lewis haberdashery departments too. A huge thank you once again to Adjustoform for sending me my new best sewing buddy. I’m in love ..
Do you have an Adjustoform that you couldn’t be without? Which type do you use? Is an Adjustoform on your wish list this Christmas? Do let me know your thoughts, I love to hear from you. Thought you might like to see the sorry state of my old girl! …. 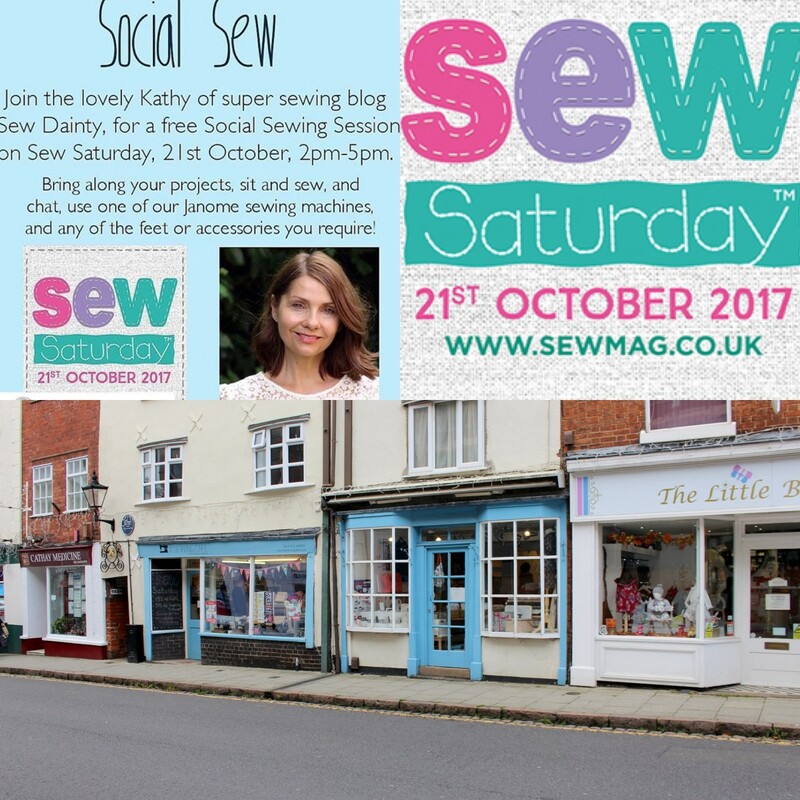 I’m guessing that a few of those of you reading this will already know about the Sew Saturday event that we have every year here in the U.K. If you are not familiar with it, it is an annual event, organised by Sew magazine, which enables us to celebrate our local bricks and mortar independent fabric store and haberdasher. Around the country, small fabric retailers sign up to take part, and offer various classes, workshops, events and discounted prices on the day. My local fabric and haberdashery store is The Sewing Cafe, which is in the market town of Hinckley, Leicestershire. It is a friendly and welcoming fabric and haberdashery store which is owned and run by Fay and Becky. Not only will Fay, Becky and the team be able to help you with all your sewing needs, the shop also offers a huge range of sewing workshops suitable for complete beginners right through to more experienced sewists as well as the use of the machines by the hour if you feel like some social sewing. Last year I attended one of the free workshops and learned how to make a couple of these triangular pattern weights. I promptly went home and spent the rest of the afternoon making a whole bunch more and now use them for EVERY sewing project I make. I can’t remember the last time now that I pinned a pattern before cutting out – it’s so much easier to use my weights and rotary cutter! This year, for Sew Saturday, The Sewing Cafe were offering a free workshop making pretty little fabric purses like this one below – totally adorable and quick and easy to make whatever your skill level. 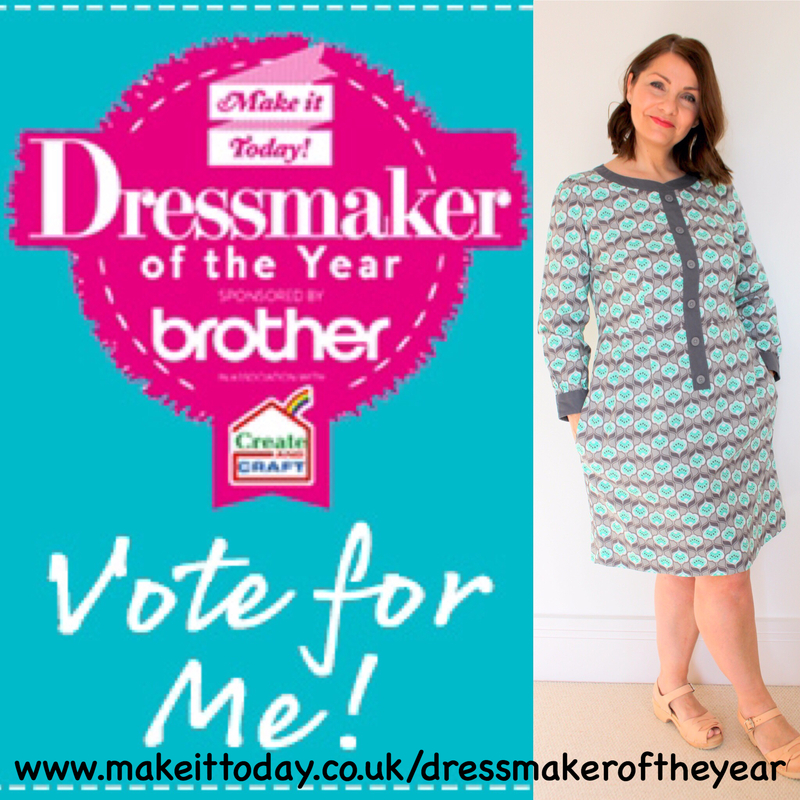 I loved that you could choose a button or snap fastening and there was a great selection of fabrics available for you to choose from. Throughout the afternoon whilst I was there, I was able to watch a steady stream of sewists disappearing into one of the sewing workshop rooms and coming out half an hour later proudly waving their pretty new fully lined purses! A free raffle ticket was being offered to each visitor on the day with the chance to win some fabulous sewing prizes, and tea, cake and generous fabric discounts were also available. The shop was buzzing! After enjoying myself so much last year, I was thrilled to be invited along this year to take part in a little ‘social sewing’ in the other workshop sewing space during the afternoon. Happy days! I promptly packed my current sewing project, which is another version of The Scout Tee by Grainline Studios, and headed on over to Hinckley! I was thrilled to be joined by some really lovely local ladies and we had such a great afternoon sewing, chatting, drinking tea and eating delicious homemade apple cake ( thank you Fay)! If I’m honest I was so busy chatting all afternoon that very little sewing was done by me but hopefully you will see the results of the Scout Tee that I started when the #owop17 challenge arrives at the end of November. Two of the ladies were whipping up pretty fabric travel tissue covers ready to sell in a forthcoming charity event. They were gorgeous! By strange coincidence two of the ladies were also both wearing handmade versions of the Tilly and the Buttons Coco pattern – one dress and one top. The top had been made in a super fleece fabric and has certainly inspired me to whip one up in a fleece for myself as the weather is now getting colder. As it happens the Coco is one of the sewing workshops offered by The Sewing Cafe – so if you are local and are interested in attending a Coco workshop or fancy a little browse through the other workshops the Cafe has to offer then you can click here. During the afternoon we were also joined by some of the ladies that needed a little more time with their workshop purses, and before I knew it the afternoon had flown by and it was time to call it a day. Thank you again to Becky and Fay for making me so very welcome, and to all the lovely ladies that I had the pleasure meeting and sewing with. If you are ever in the Hinckley area I would highly recommend that you pop in for a little visit, and if you’re not local you can still have a little mooch through their fabulous fabrics, patterns and haberdashery items on their online shop which you can find on the website here. If you’re a bit of an Instagram fan like myself, you might be interested to see what the Sewing Cafe are getting up to here. This way you can check out their new fabric arrivals and get to know which events they are attending. I hope that whatever you did for #sewsaturday that you had a great time and enjoyed the hospitality and sewing knowledge that our lovely independent fabric retailers can offer us when we call in to visit them. 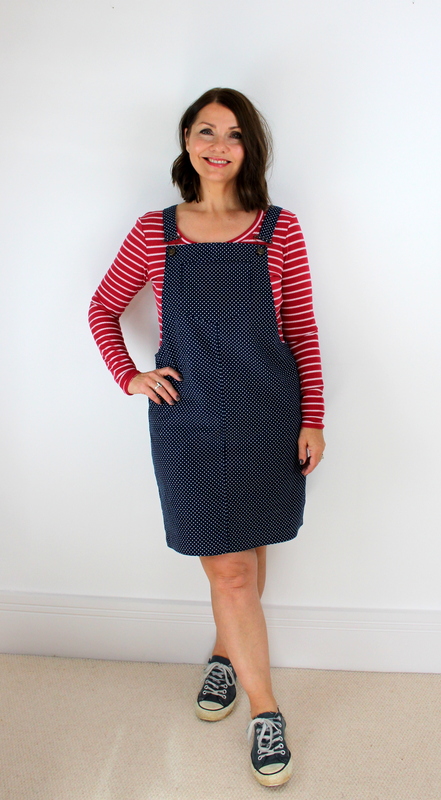 Sewisfaction Blogger Team Post – The Flatter Me Frock by Sew To Grow. Today’s the day – it’s my first blog post as part of the Sewisfaction Blogger Team. For my first post I have chosen to make The Flatter Me Frock by Sew to Grow using this amazing butterfly rainforest cotton linen. My full review can be found here so do head on over to read all about it and check out lots more photos. Look forward to seeing you over there!